Heat oven to 350°F (325°F for dark or nonstick pans). Grease and lightly flour 13x9-inch pan. Make and bake cake as directed on box for 13x9-inch pan. Cool completely in pan. Poke holes in cake using fork or skewer. Pour 3/4 cup of the chocolate syrup over cake; let stand until most of the syrup soaks into cake. In large bowl, beat peanut butter and whipped topping with electric mixer on medium speed until combined. Spread over cake. Using large chef’s knife, cut peanut butter cups into fourths. Scatter over frosting. Drizzle with remaining 1/4 cup chocolate syrup. Cover and refrigerate cake, but bring to room temperature before serving. Cover and refrigerate any remaining cake. Add more or less chopped peanut butter cups to your liking. 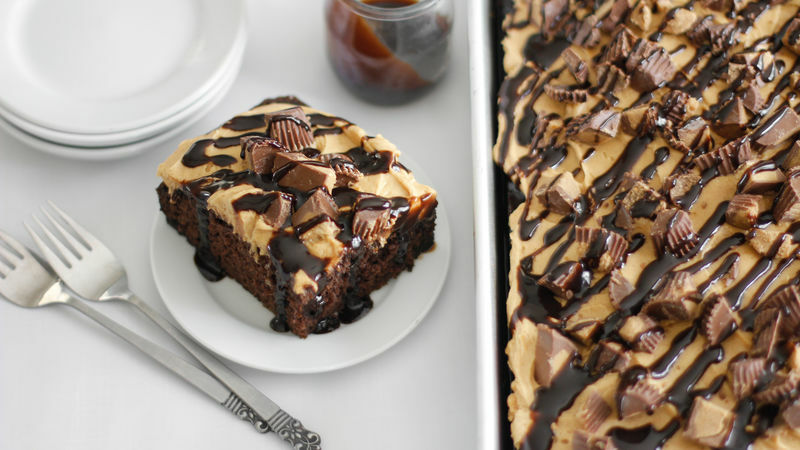 Candy-coated peanut butter pieces would be an excellent addition to the cake batter.